Three countries form the Province of the UK and Ireland: England, Ireland and Scotland, each of which has its own culture and tradition. However, many multi-cultural and ethnic groups have now established their homes within these countries. 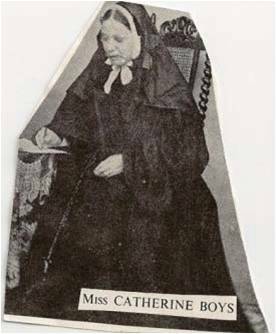 It was during a visit to London to arrange for the departure of a group of Sisters to the Missions in New Zealand that our foundress Euphrasie Barbier was invited to take over an orphanage founded by Miss Catherine Boys at Queen Anne House, Middle Street, Deal Kent. 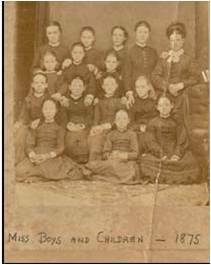 Euphrasie promised to consider the proposition, for it had long been her dream that a house in England might be available, where the Sisters, training for missionary work, could stay and learn English before embarking for missions in English speaking countries. Because of the gravity of the situation in France caused by the revolution Euphrasie also realized that a foundation in England could serve as a refuge for the Sisters in difficult times. Having said Goodbye on the 10th October to a group of Sisters going to New Zealand and also a group waiting to set sail for Tonga and Samoa, Euphrasie, on the 13th October took with her Sr. M Wilfred, two other professed Sisters and three Novices to establish the ‘First Foundation of the Congregation on English soil’ and to take over from Miss Boys the running of the orphanage at Queen Anne House. Money for the running of the Orphanage being scant Euphrasie undertook many humiliating and exhausting begging expeditions to London to raise funds. 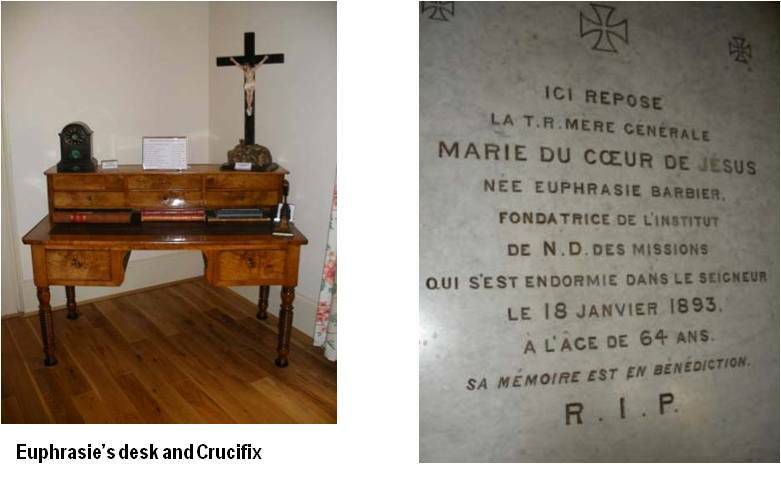 She travelled to France where her chief duties lay but returned often to comfort the invalided Miss Boys and to help the Sisters in the management of the orphanage. 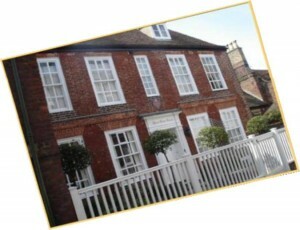 The orphanage and school flourished and when larger premises were needed, Turret House in Queen Street was bought with financial help from Duchess of Norfolk, Lady Georgina Fullerton and many other influential benefactors. In 1901 when Religious orders were expelled from France many of the sisters from France came to live in Deal. The Mother House and Novitiate were moved from Lyon France – first to Deal and then later to Hastings, Sussex, England. The Mother House remained in England until the opening of the Generalate in Rome in 1968. In 1892 Euphrasie paid her final visit to Deal. 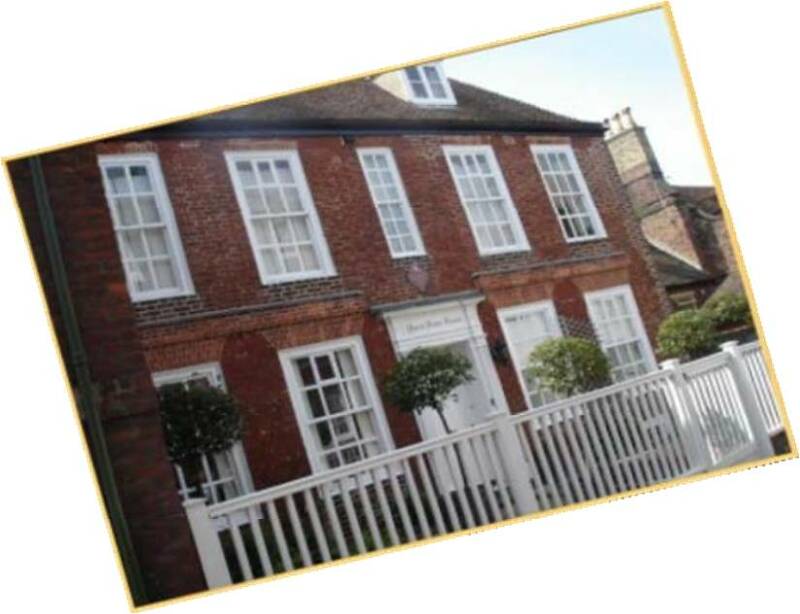 From there she went to Sturry, where she had on the 14th October 1881 opened her second convent in England. On the 18th January 1893, in the shadow of Canterbury Cathedral, Euphrasie died surrounded by her community. 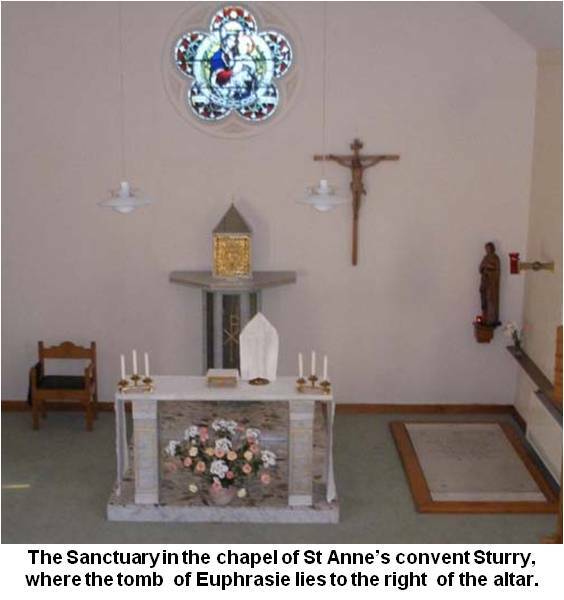 Her remains were laid to rest in the vault in St. Anne’s Convent Chapel at Sturry. 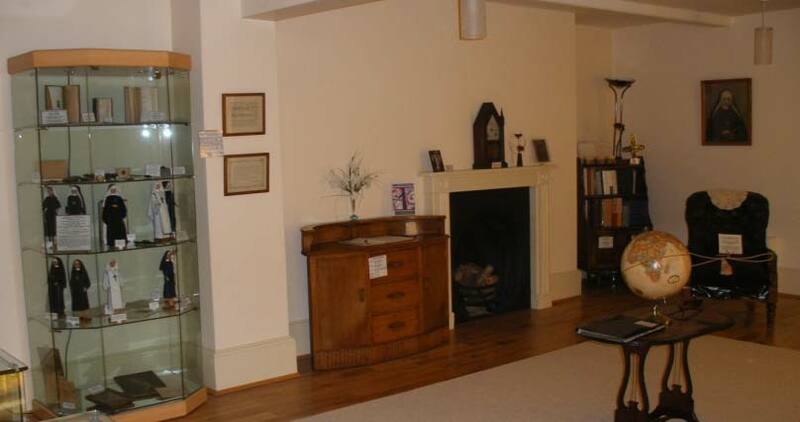 The original house founded by Euphrasie in Sturry is now the ‘Heritage house’ and displays many of Euphrasie’s personal belongings and the things she used. 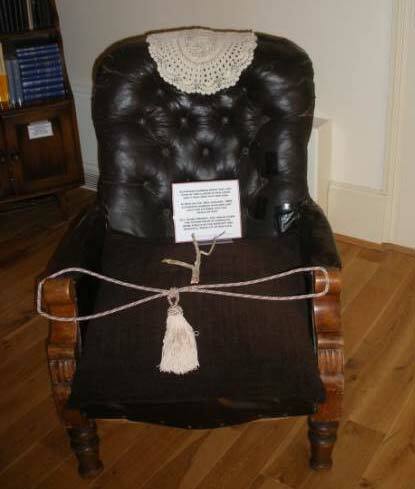 Euphrasie’s chair – Here she sat during the last days and ours of her life. Historically the Province of the UK and Ireland has always had Sisters missioned to other countries, and down the years this has taken them to: Aotearoa New Zealand, Australia, Bangladesh, India, Myanmar (Burma) Philippines, Samoa, Papua New Guinea, Canada, Peru, France, Kenya and Rome. The Mission in Kenya East Africa was opened by the Province in 1967 and during Kenya’s 50 year History 51 Sisters from the Province have worked for some time in Kenya. The Mission has thrived and today our own Kenyan Sisters alongside sisters from other countries continue to develop the Mission there and are themselves being missioned to other parts of the Congregation. 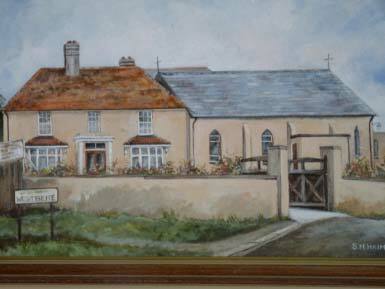 In the late 1960’s a change began to take place from the traditional works of the Congregation e.g. Education in Schools. In order to answer the needs of the times, sisters began to move into Pastoral ministries, nursing and ministries among the marginalized. Projects with and for families were undertaken developed and then passed on to others and are continuing very successfully. As sisters retired from teaching, many with their vast experience, moved into Pastoral work.